Nightscout (CGM in the Cloud) is an open source, DIY project that allows real time access to a Dexcom G4 CGM from web browsers via smartphones, computers, tablets, and the Pebble smartwatch. The goal of the project is to allow remote monitoring of the T1D’s glucose level using existing monitoring devices. The Nightscout system allows you to attach a device (called an Uploader … most likely an Android smart phone) to the Dexcom G4 receiver that transmits the glucose readings to the internet, where any web-connected device (smart watch, tablet, computer) can view the numbers. It’s that simple. Nightscout comes with a whole new vocabulary … and at this point, is supported by volunteers and programmers, who are improving the system daily. You’ll hear words like Rig (a device that securely holds your G4 and your Uploader, connected by an OTG cable), Pebble (popular smart watch), Ting (internet data service), Azure or Heroku (free cloud-hosting services), and much more. Question: Isn’t this more complicated than simply carrying the G4 receiver? The answer is yes, of course. Its great advantage is remote monitoring (a parent can monitor a child’s BG at school, a spouse can monitor an out-of-town T1’s BG). But even for me, I love the freedom of not having to dig into my pocket to pull out my G4. All I need to do is look at my watch. I do have to carry the rig, with is larger and heavier than the G4 alone … but I just stash it in my handbag and off I go. Question: Isn’t it costly? Well, sure, I had to buy the parts (2 Android phones, a data plan, a cable and a rig) … but this is NEW technology. It’s not perfect but it is leading edge and pretty exciting. Question: What if you have questions? 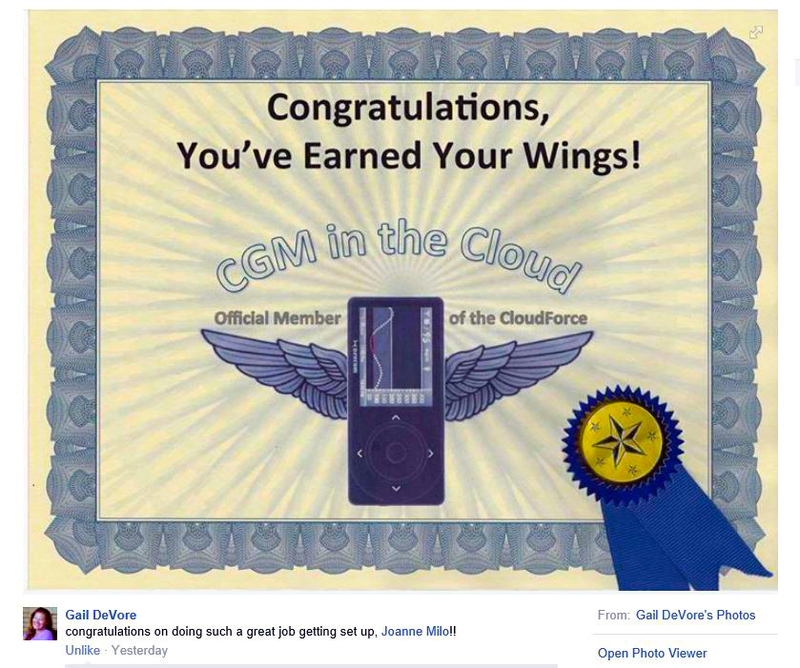 Well, there is an amazing closed group on Facebook called CGM in the Cloud. All I have to do is post a question and, most likely, I will have an answer within 5 minutes, from volunteers who will also cheer me on! Question: Is it worth it? To me, yes! I love to just look down as see the “number.” Every now and then, a message scrolls across my watch, such as “Don’t Worry, Be J” or “Everything is Awesome!” Just makes me smile!